Education Secretary Betsy DeVos, mulling whether to scrap an Obama-era guidance document designed to reduce racial disparities in student discipline, held “listening sessions” Wednesday with stakeholders on both sides of the heated debate. DeVos heard from proponents who say the guidance helps at-risk youth avert the school-to-prison pipeline and those who call it a “top-down” mandate that has made schools less safe. The secretary spoke to organizations, educators, and parents on all sides of the ideological divide. 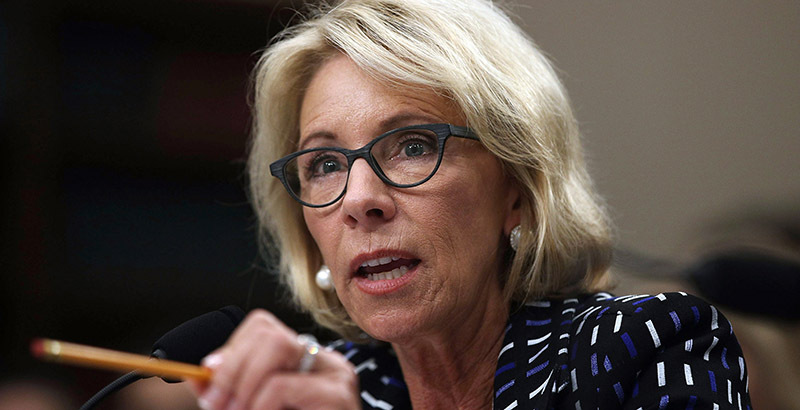 While those present say DeVos did not tip her hand, at least one participant said she made a “real connection” between the 50th anniversary of Martin Luther King Jr.’s assassination Wednesday and the racial disparities that exist in school discipline. Those conversations may have been overshadowed, however, by the release of a report Wednesday from the Government Accountability Office (GAO), the government watchdog agency, that appears to affirm much of the rationale behind the 2014 letter. In its analysis of the 2013-14 school year, the most recent year for which there is data, the GAO found that black students, boys, and students with disabilities are disproportionately disciplined compared to their white, non-disabled peers. Disparities were most prevalent for black students, who represented 15.5 percent of public school students and 39 percent of youth suspended from school. Those disparities, the report found, persisted despite student socioeconomics — a counter to critics who argue that higher suspension rates are chiefly the product of poverty. The disparities also persisted across school types, though they were most acute in charter schools. Although student discipline has received heightened attention in recent months — especially after Republicans, including President Donald Trump, linked Obama-era discipline reform to the February school shooting in Parkland, Florida — the origins of the latest GAO report precedes the current turmoil by several years. “The analysis shows that students of color suffer harsher discipline for lesser offenses than their white peers and that racial bias is a driver of discipline disparities,” Rep. Bobby Scott, a Democrat of Virginia who called for the GAO report, said in a statement. An Education Department spokesperson did not respond to a request for comment on the GAO’s findings. In 2014, the Obama administration’s Departments of Education and Justice released a “Dear Colleague” letter notifying districts across the country that racial disparities could be the result of discrimination and in violation of federal civil rights laws. Unexplained disparities could alert federal authorities to potential bias and prompt an investigation, the document notes. Rescinding the Obama-era discipline guidance has been up for consideration since DeVos took the helm at the Education Department. And while stakeholders on both sides of the debate have met with education department officials over the issue several times, Wednesday was the first time DeVos participated in a roundtable discussion on the topic. Although the Education Department held a telephone briefing with reporters after each listening session on Wednesday, the meetings themselves were closed to the press. One of the educators present was Fallon Daniels, an assistant principal at Connecticut’s Danbury High School, who has worked as a school administrator for six years across three districts in the state. In an interview, Daniels said that she’s never felt pressured to refrain from suspending students who act out. However, she sees benefits to having alternatives. Students who face frequent suspensions quickly disengage from school, she said. But the document also received fierce backlash from critics, who argue the guidance document was a “top-down” mandate that intimidated schools to reduce suspensions or face federal investigation — a move they say made schools less safe. The GAO report noted, however, that suspensions were on the decline before the Education Department issued the guidance document. In a survey of 850 school leaders from 47 states, the AASA, the superintendents association, reflected a middle-of-the-road approach to the issue that challenged the rhetoric on both sides. Ann Miller, a board member at Baltimore County Public Schools, offered a similar take. Shortly after the Obama-era guidance was released, the state education board in Maryland adopted a policy designed to reduce suspension rates, a decision she chalked up to federal pressure. The suspension rate at Baltimore County schools has actually increased over the last several years, and a recent report found black students and those with disabilities are disproportionately disciplined. But, in Miller’s view, suspensions didn’t increase enough to keep pace with student disruptions.